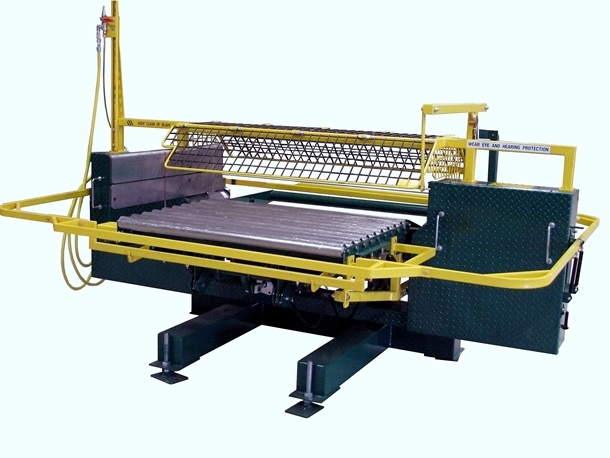 “SmartSaw” is multi-functional: designed for “repair” (1-Person) or “recycling” (2-Person) operations of “GMA STYLE” pallets & other stringer pallets. Standard 10 HP, 3-phase, electric motor with gear reduction drive. Air actuated, 3-position, roller table and table extension easily positions GMA pallet for board removal. Machine provided with “advanced safety measures” in place, including, among others, interlock switches for perimeter guarding and cabinet doors, canopy guarding with front & back portions that move up & down with the roller table, hydraulic blade tensioning pressure safety switch, and “Monitoring Safety Relay”, or MSR, to alert users of safety malfunctions. Designed to QUICKLY (as a “1-person” operation) cut out damaged boards, including “bottom” deck boards, “top” lead & other deck boards, as well as “MIDDLE” & “OUTSIDE” stringer boards. Also designed, as a “2-person” operation, to process the disassembly / tear-down of GMA pallets for “INCREASED LUMBER RECOVERY”. SmartSaw can be “easily integrated” into a full line pallet repair system. SmartSaw can be set up with optional conveying equipment to handle discharge from backside of machine, as well as alternatives for infeed of pallets to SmartSaw and outfeed of pallets already prepped and going to repair tables.